How To Get What You Want - Once And For All! Powerful Black Magic For The Truly Determined! Authors Seth & William Van claim they were offered money by other occult publishers NOT to publish this book! THIS BOOK CONTAINS THE INFORMATION MOST OCCULTISTS WANT KEPT STRICTLY SECRET! For in this book are dark formulae for GETTING WHAT YOU WANT ONCE AND FOR ALL - the black magic way! Finbarr decided to publish it, but we are banned from advertising it anywhere except in our own catalogue! THE SERIOUS OCCULTIST SHOULD BE FREE TO CHOOSE WHAT OTHERS DO NOT WANT HIM TO HAVE! No one is forcing you to buy this book or to practice its dark rituals! HERE IS GENUINE BLACK MAGIC WHICH BULLDOZES OBSTACLES AND BRINGS WHAT YOU WANT INTO YOUR LIFE, AT LONG LAST! This book gives you the precises dark seals and symbols for summoning sinister forces - forces that will automatically do your bidding! Now you can have any man or woman you desire! Now you can create a blinding desire for you in another person! You can make another person crazy for you! This book contains powerful black magic rituals which have not been published in Britain or America before, and possibly nowhere else! NOW YOU CAN CURSE AND PERMANENTLY STOP ANYONE WHO IS STANDING IN YOUR WAY! NOW YOU CAN CURSE SOMEONE WITH ILL HEALTH - IF THEY DESERVE IT! NOW YOU CAN BRING SOMEONE UNDER YOUR COMPLETE CONTROL! This is not a book for the merely mischievous - it is not for inflicting harm merely for the 'fun' of it. No, the rituals here should only be used by those people who feel there is no alternative. It is for the individual who has been turned away or ostracized by other for no sane reason. BLACK MAGIC IS THE ONLY WAY OF FIGHTING BACK, according to the authors! IMAGINE YOU DESIRE SOMEONE WHO IS ALSO WANTED BY OTHERS. THE OTHERS MAY HAVE AN UNFAIR ADVANTAGE OVER YOU. WHAT DO YOU DO? 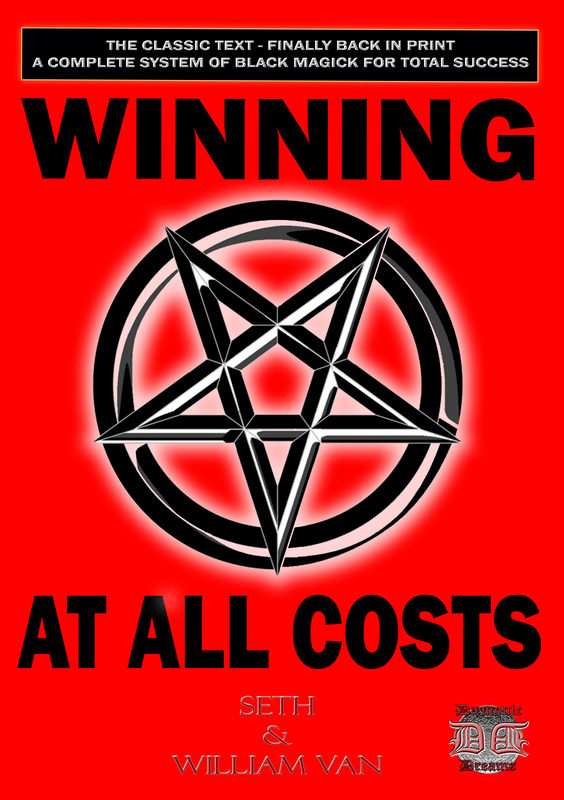 'WINING AT ALL COST' IS ABOUT CLEARING THE WAY SO THAT YOU ARE THE ONLY PERSON AVAILABLE TO THE OBJECT OF YOUR DESIRES. BLACK MAGIC WILL MAKE HIM/HER WANT YOU! Black magic can make you rich! It can make you powerful! It can bring you respect! It can give you control over people and events! IT CAN ALSO HELP YOU TO GET RID OF PEOPLE AND UNWANTED CIRCUMSTANCES! A lover who becomes a liability can be eased out of your life - for reasons they will not understand, they will simply want to leave you of their own volition, not realising that it is your secret black magic ritual that has made them do it! You can eliminate rivals in any sphere. No, it doesn't mean that they'll all drop down dead - it just means that your magic will make them step aside (even against their own will!). There are also deadly black magic rituals of revenge and destruction. Consider these only if you are bitterly grieved. These rituals can cause havoc - but you should only use them, say the authors, if your case is just. WE SUGGEST YOU DON'T BUY THIS BOOK IF YOU ARE IN ANY DOUBT. This book is only for the committed - for those who want to win at all cost. You can bind a lover to you, even dominate one. You can get money. You can acquire money through an inheritance. THERE IS A PRECISE RITUAL FOR EACH AND EVERY ONE OF THESE AIMS IN THIS BOOK. YOU CAN GET TO THE TOP IN YOUR CHOSEN CAREER. No matter what the obstacles you will simply rise to the top through your systematic use of black magic. Your rivals will either fail or get side-tracked. If you want to get to the top or be famous you need to know that magical secrets of 'Winning At All Cost'. 'Winning At All Cost' is not about hurting others for the sake of it. The only people who may get hurt, say the authors, are those who deserve it or who have taken unfair advantage of you. In life there are only winners and losers. Unless you make a conscious decisive choice to be otherwise you will end up as just another loser. You can get the job you want. You can get the promotion you seek. You can become famous, if that's what you seek. Just perform the appropriate rituals in this book. YOU CAN POSSESS INCREDIBLE MAGICAL POWER, if this is what you want. You can summon even the dead to obtain secret information which only they have. YOU CAN HAVE THE POWER OF REVENGE, IF YOU ARE GRIEVOUSLY WRONGED YOU CAN PERFORM THE RITUAL WHICH WILL TEACH THE WRONG DOER A LESSON THEY WILL NOT FORGET! If you have been robbed or cheated of money you can do the appropriate revenge ritual in this book! If someone has stolen your loved one you can exact revenge on that person. Let no one tell you that revenge isn't sweet. Those who practice black magic will tell you that it tastes very sweet indeed! If you are of a nervous disposition you should not buy this book. This book is about summoning dark forces to do your bidding. The rituals are strong and powerful. They are also safe for as long as you follow the simple instructions. You are shown how to control dark forces - not be controlled by them. There are no blood sacrifices to perform: the rituals can be performed in the privacy of your home. If life has handed you a raw deal... if you are sick of being disappointed... if you are tired of always having to accept second best - then you should consider WINNING AT ALL COST.